The Cutty Sark arriving in Greenwich in 1954. Next week marks 60 years since the Cutty Sark sailed into the Greenwich dock where it has remained ever since. 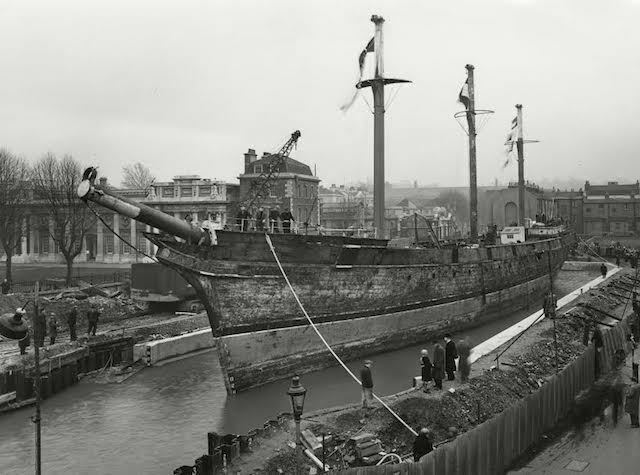 As part of the anniversary celebrations, Royal Museums Greenwich is asking the public for their memories of the ship; whether you trained on it when it was docked in Falmouth or Greenhithe, if you remember its arrival in Greenwich in 1954, or if you've visited it since. For us, it's sitting at home every April as a child, watching on the TV as droves of London Marathon runners sped past those famous masts. On 10 December, a special Tea and Memories event is being held with afternoon tea, parlour games and conversations about the ship. Anyone with memories about the vessel or thoughts on the importance of preserving it is encouraged to go along and take part. The event is free, but booking is required, and conversations will be recorded. Having travelled the world since 1869, the ship was brought to Greenwich in 1954 and underwent an intense restoration project before being opened to the public in 1957. In 2007, the ship was damaged by fire whilst undergoing another restoration project (which, fortunately, meant that many of the original parts were in storage and therefore not lost), and was reopened by the Queen in 2012 after extensive repairs. If you can't make the event but still have memories to share, you can join in on the Cutty Sark Facebook page or on Twitter @CuttySark using the hashtag #CuttySark60.